PBSL's Cast Iron Guttering, supplied by Yorkshire-based foundry Hargreaves, is produced using traditional procedures to BS 460 and offered in four different sizes —100mm, 115mm, 125mm, and 150mm. It is available in either a black gloss paint finish or a grey primed option, which gives protection on site before the final paint coatings are applied on site in your own choice of colour. 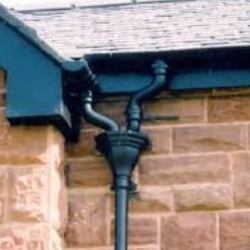 Half Round Cast Iron Gutter has been used for generations as a guttering material can be in the UK. 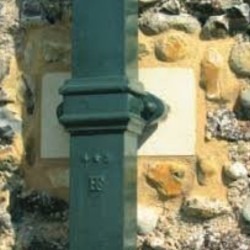 In use since the Victorian era, this variety of gutter epitomises a classic tradition that has existed for over a century, throughout diverse developments in structural technology. Sturdy, durable, and able to be totally recycled, Cast Iron is a widely used material in every type of application in the UK building trade due to its strength and longevity. Much preferred by public bodies and governmental buildings, it is equally at home on private houses, churches, schools and colleges. Cast Iron Gutters are also an extremely popular selection for listed buildings. Cast Iron is a remarkably durable material — many authentic installations from as early as the Victorian period still exist within the UK in, around the North of England and London in particular. When maintained accurately, Cast Iron Guttering outlives all competing products made from alternative materials. Because Cast Iron is connected to tradition, it is used especially well on period-style properties, from Victorian terraces to one-off houses. As well as this, it is the most-used guttering material on listed buildings; a large number of planning officers refuse to accept alternative materials. Iron is sourced naturally, so it is completely recyclable — combine this with its incredibly long lifespan, and Cast Iron can be justifiably seen as a truly environmentally-friendly material. The majority of PVC Gutter manufacturers incorporate adaptors to half round cast iron in their collection. These adaptors typically consist of a compressed rubber seal, making an impermeable joint by tightening a PVC strap, normally with a nut and bolt assembly. Also available are adaptors to Cast Iron Ogee, which attach the PVC gutter to the metal by using a nut and bolt through the gutter section, and furthermore make the joint by using silicon sealant. Every Cast Iron Gutter and Downpipes is available in 1830mm length, with pre-drilled openings which allow for nut, bolt, and silicon fastening. Full instructions for installation that are easy to follow on site can be found in our Guides & Tips section. If you instead merely want more information about Cast Iron Guttering before placing an order, we have composed a collection of articles that will aid you in your decision. Click here to see our top tips for buying Cast Iron Guttering and our report on the features and benefits of Cast Iron Guttering. 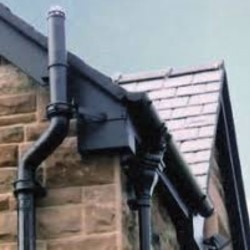 Our Cast Iron Gutters, Fittings and Downpipes are all available with next day delivery. If you require any technical advice or help with your purchase, please do not hesitate to contact us. Please be conscious of the fact that all returns of Cast Iron Guttering will suffer a re-stocking fee of 25% for standard items and 50% for painted items. Unfortunately, this fee is imposed upon us by the manufacturer and is consequently beyond our control.